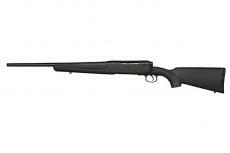 Savage Axis Bolt 243 Win 20"
Axis rifles save money without sacrificing performance. Savage didn't design a cheaper rifle; they designed a better way to make a Savage, including pillar-bedded barrels with more uniform cooling and greater consistency. The Savage Axis has been rated best-in-class entry level rifle. These left-handed Axis models are perfect for southpaw youth shooters. The modern design with silky-smooth bolt operation, a detachable box magazine, matte black synthetic stock and a 20" black carbon steel barrel allow for multi-purpose shooting in multiple locales. It is drilled and tapped for scope mounts.